He cuts a tall figure on his immaculate blue suit as he addressed women groups from Tagare Ward and former councilors from across Migori county during his most recent campaign trails. Solomon Hodo speaks fluent Kuria and can easily change to Dholuo and Luhya when traversing the county to seek votes as the next senator. Hodo is articulate as he speaks on why he wants to replace the incumbent Wilfred Machage as the next senator. “There is a belief that a senator lacks funds to make him come to the ground often, but the seat is best placed in playing an oversight role on the county government operations,” Hodo said. Hodo took a swipe at Machage, whom they share the same constituency as an absentee leader who stood and look on at the running of county government. 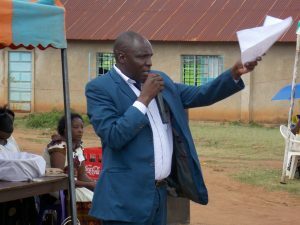 Hodo is a former principal at Nyametaburo Mixed Secondary School in Kuria West where he resigned to concentrate on his busineses and campaigning for the seat. He owns the Sunshine Group of Schools based in Nakuru, Isebania and Mwanza Tanzania by capitalizing on his first degree as a teacher from Kenyatta University before taking his Masters degree at Nazerene University. “I easily conform among the Luos, Kuria and Luhya communities in the county which makes it better to bring a county appeal by representing all communities,” he said. Hodo, is from the Luhya community but was raised in Isebania area of Kuria West which has made him to be well versed among all communities in the county. He will vie on an ODM ticket and enjoys close relation with Cord leader Raila Odinga through his wife Ida. “I don’t any appointment to meet my party leader which shows I am not a green horn in politics,” he said.